ON A BALMY Kiev night, the sun isn’t too far off coming out. There is still, however, absolutely no sign of any of the Spanish players coming out of the Olympic Stadium dressing room. It’s almost 2am and, understandably, they’re still enjoying their latest landmark victory with old friends. David Villa and Carlos Puyol are in there smiling, Placido Domingo is in there singing. Iker Casillas and Sara Carbonero aren’t kissing – to the disappointment of the Spanish media – but they are hugging. Typically, the players are in no rush to leave. That unhurried feel, however, suits the whole atmosphere of the night. This isn’t the energetic jubilation of 2008 or the emotional relief of 2010. There’s a serenity about the celebrations in Kiev, a sense of professional satisfaction. Even completion. They have, after all, made history. And, if the Spanish players are not quite crying the salt tears of Alexander the Great when he realised there were no more worlds to conquer, they aren’t quite crying tears of joy either. Half of that, though, might be that it just hasn’t sunk in. When Cesc Fabregas eventually emerges with a broad smile on his face and a third international medal hanging from his neck, he attempts to explain it. This feels really amazing, one of the best days of my life. I don’t think we’re ready to see what we have done yet. Three major trophies in a row has never been done before in the history of football. It’s difficult to realise what we have done but, in time, I think we will. It is amazing. Befitting his style on the pitch, Gerard Pique was even more serene. A job was certainly done on the Italians. There was a significant gap between the last Italian player leaving and the first Spanish player coming out. Not surprisingly, that Italian was Mario Balotelli. Even less surprisingly, he glared fairly angrily at a journalist who asked for a few words. To be fair, the moment that the journalist motioned forward, the Italian press officer had shot him a glance as if to say “definitely not tonight”. What’s more, other than a downbeat Andrea Pirlo walking past without talking but accepting a few handshakes, the Italians were perfectly prepared to stop and lionise the Spanish. The defeat, after all, was no shame. Italy were mere details on a night when everything that has contributed to this Spanish era of success combined and culminated in one glorious crescendo. Afterwards, the Spanish players themselves simply seemed in awe of the level of performance the team had reached. Most just puffed out their cheeks and talked of a ‘partidazo’ – an immense display. They were also in awe of their manager. Every Spanish player interviewed spoke with reverence of Vicente Del Bosque and the calm and intelligence he brought to the team. Typically, having led the way throughout the tournament, he was the first out from the Spanish dressing room, accompanied by media officer Paloma Antoranz. Often deadpan in his media press conferences, he was only smiling serenely here and accepting handshakes from every journalist. There were, after all, no more questions to answer. Not about whether Spain could make history or whether they were making people bored. The champions had been as exhilarating as they had been exceptional. That last issue, though, was put to a number of the players. “Those people who think we are boring… in my opinion they don’t understand the game,” said Fabregas. When it was put to him that his old manager, Arsene Wenger, had been particularly critical, the midfielder/forward did backtrack slightly. Casillas went a little more in-depth. Pique, meanwhile, was more emphatic. We firmly believe in this style. We believe in Vicente, the manager, and he is the clearest example of composure and silence. He talks with a lot of credibility. He is the foundation of this success. At the end, you can talk a lot outside. Everyone has an opinion. But, in the end, if you know what you’re at and you know what’s within the camp, they can say what they want. At the time Pique was saying this, Fernando Llorente walked by, affectionately patted him on the back and said ‘monster’. Similarly, as Andres Iniesta was speaking to a few journalists with the man-of-the-match prize in his hand, a beaming Pepe Reina walked by nodding his head and saying “MVP!” – most valuable player. These were little moments but also those which shed light on the particular togetherness of this side. “The group is more than just a team,” Fabregas said. “We are friends. We like to play cards, to be together. 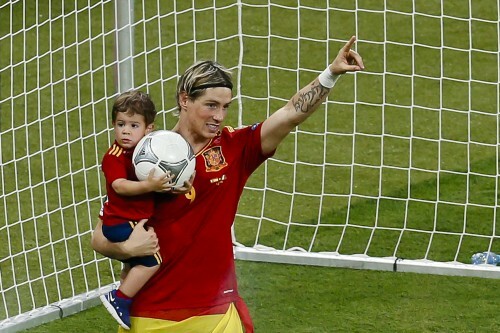 Certainly, the majority of the Spanish players are very down to earth and devoid of pretension. Many are very good and articulate speakers. None reflect the maturity and cohesion of the squad more than Xavi or Casillas. Two absolute totems on either side of the one of the bitterest club rivalries in football, they come together harmoniously for Spain. Indeed, when relationships between Barcelona and Real Madrid reached their lowest about a year ago, it was Casillas who made the call to Xavi to ease emotions. “We have thought about it,” Casillas explained in Kiev. “We have had virtually the same footballing career. We have gone side by side. We have ended up sort of leading our respective teams, me at Madrid and him at Barcelona. Together we have made history for Spain – even though we are not yet conscious of that, I don’t think. Questions inevitably turned to the future. Can Spain keep it up? Will some of the individual players keep going? “Time goes by for everyone. As a goalkeeper, I can carry on for a bit longer but there are people below us pushing us hard. “And I tell you something: in a couple of years there will be new players and although it is true that we have a great under-21 team, you have to unite that group and make it work. “We have got used to winning from a very young age. We won the under-16s, the under-19s, the under-20s. Almost everyone here has been through those categories. Fabregas was a little starker. Of course, a quadruple would involve even more dimensions of history: becoming the first European team to win in South America. ‘This’, of course, being the Henri Delauney trophy. It was in the arms of the last Spanish player to come out, Sergio Ramos. A player who had a magnificent tournament, he gracefully stood and let journalists in the mixed zone – many of whom were momentarily leaving aside professional obligation – to pose with the silverware. Then, off he went. The sun was coming out. But there was absolutely no sign of it coming down on this Spanish era of success.